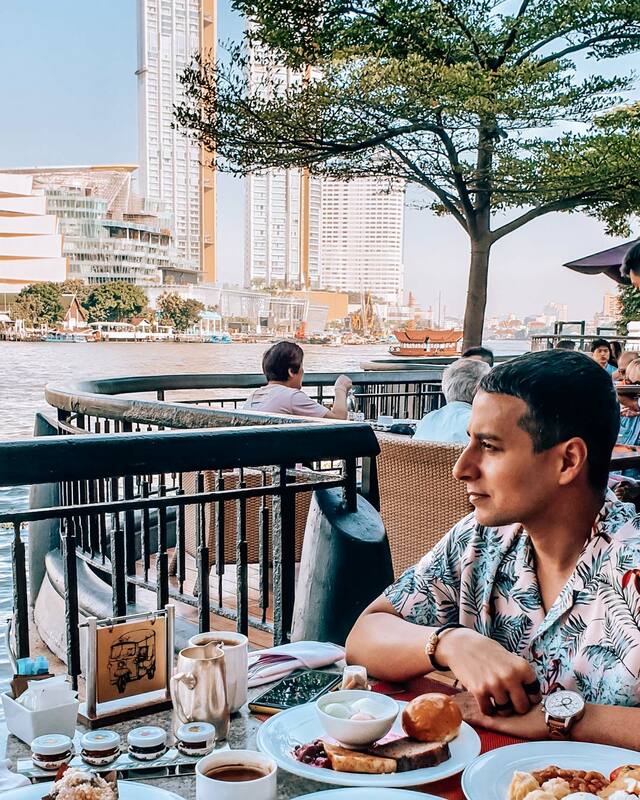 During our visit to Bangkok, we wanted to stay by the river for a few days and the Shangri-La Hotel Bangkok was definitely the perfect hotel for that. 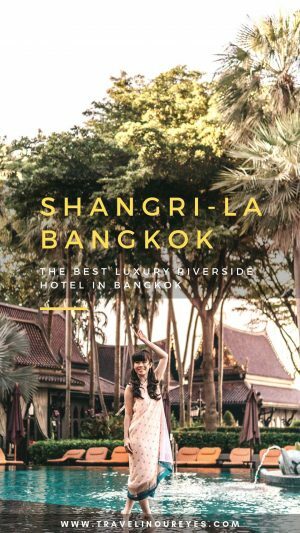 Shangri-La is a luxury riverside stay in Bangkok offering stunning views of Bangkok city. We were constantly amazed at the gracious Thai hospitality! 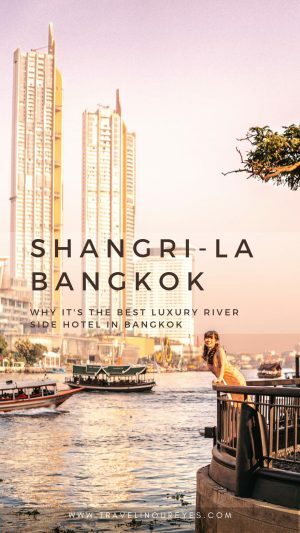 We had such a lovely stay there that we want to show you why Bangkok’s best riverside hotel is the Shangri-La Hotel. 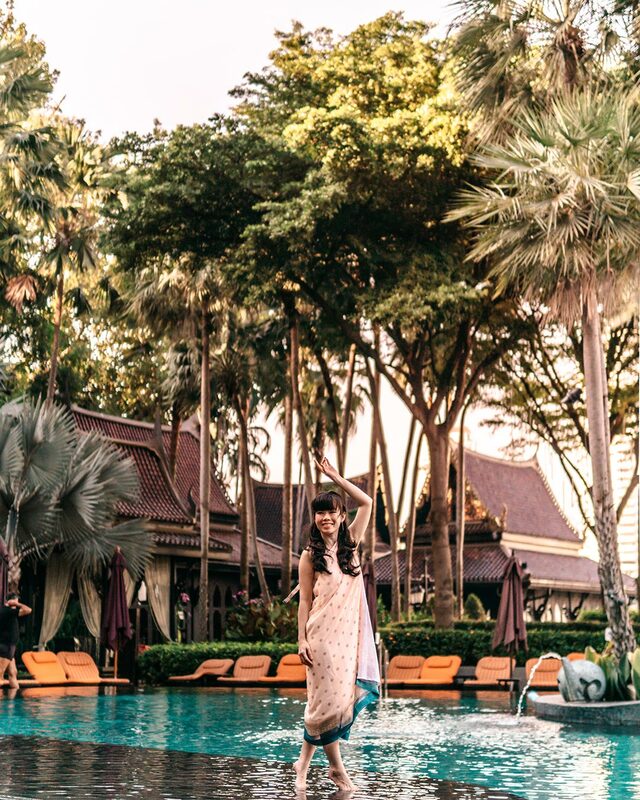 Here are 6 reasons why (with more than 6 photos) you should stay at the Shangri-La Bangkok. The hotel is located near the most popular Wats, which means less travel time! It is also located by the river, which gives you stunning view of the city of Bangkok, during the day and at night! And you can get to the nearby Wats by the tourist boat, skipping the traffic altogether. This is definitely one of the top reasons to stay at the Shangri-La Bangkok. 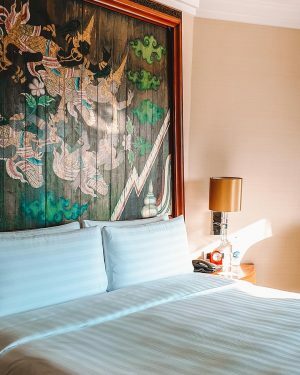 The hotel has 802 elegant guest rooms and suites featuring a compelling blend of traditional Thai décor and modern comforts, each with alluring views of the gardens, city or river. We stayed at a river-facing room. The views from our window took our breath away! 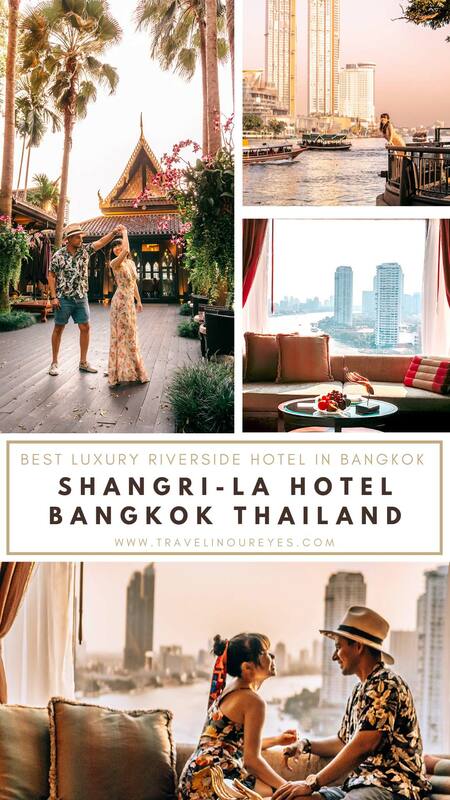 It definitely is the best Bangkok riverside hotel that should be in your bucket list. Plus point – you can watch the sun sink below the horizon every evening. Let’s face it. Everyone looks forward to the hotel breakfast when you’re on holiday! And the breakfast here raised the bar. They had a massive egg station, Thai, western, Indian breakfast cuisines, pancakes, pastries, bread, meats, ice cream wheel and gluten-free options. Was definitely buffet spread to feast on! And a major plus point – you can sit by the river and watch boats pass by while enjoying your breakfast. Definitely a good way to start off your day and a good reason to stay at the Shangri-La Bangkok. Every spot is beautiful and romantic. The room, which has an amazing view of the river. The sun sets seems to set just behind the river where the hotel is, putting a show of the most beautiful colors every night. We know that rooftop pools are all the rage, but the pool at Shangri-La Bangkok is definitely something else! It’s beautiful with coconut everywhere to give out a very resort vibe. Here is the perfect place for you to chill out and take a short break! 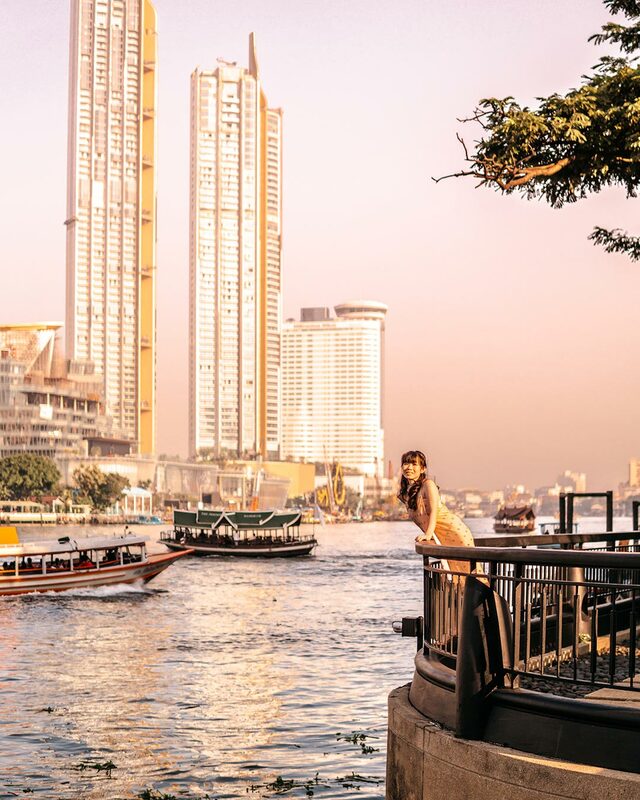 Bangkok’s Chao Phraya River is always active and is undeniably one of the best attractions in Bangkok. Dining on a river cruise is definitely something you should not miss! 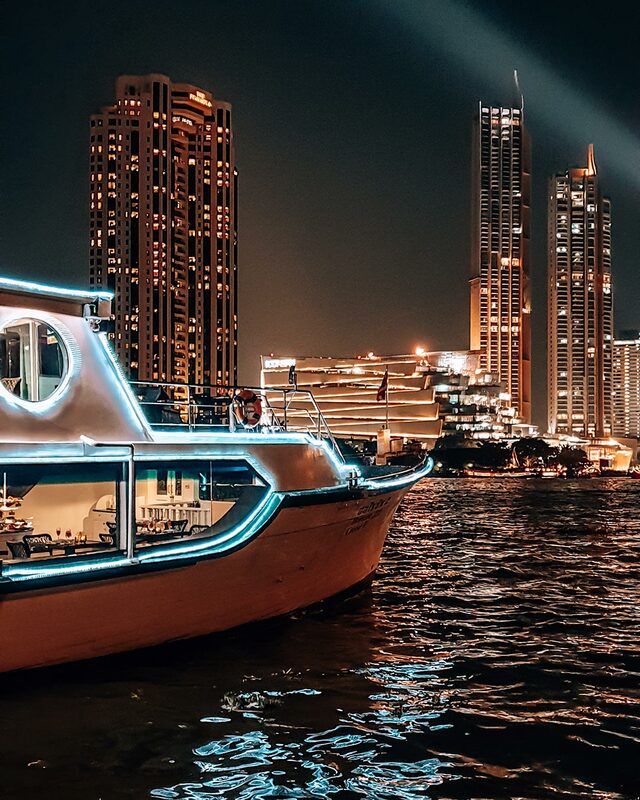 And if dinner on the boat isn’t your thing, the Salathip restaurant at Shangri-La is by the river and the perfect spot to enjoy a romantic dinner. Experience a bit of culture right there in the restaurant with the food and a Thai cultural dance performance every night! We totally love it here! 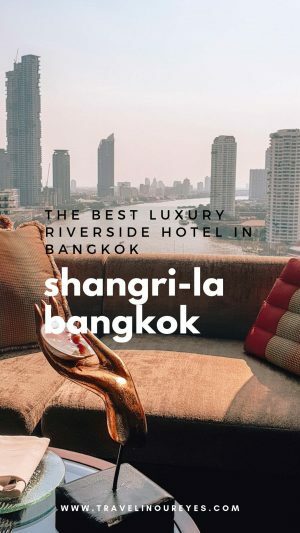 It is definitely the best riverside hotel in Bangkok that should be in your bucket list on your next trip to Bangkok. If it’s your first time visiting the city, check out our blog Bangkok Travel Guide for First-Timers for all you need to know about Bangkok. Feel free to ask us any questions if you’re thinking of staying at the Shangri-La Hotel Bangkok and we’ll be happy to help! 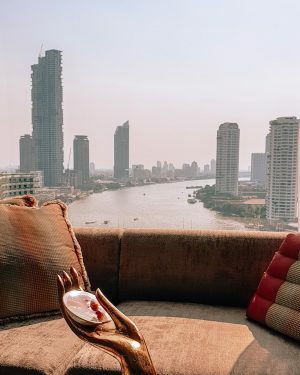 SHANGRI-LA BANGKOK: A luxurious haven right on the banks of the Chao Phraya River with some of the most amazing sunset views. Perfect base for those who want to explore the Grand Palace and the city’s amazing Wats by the river. 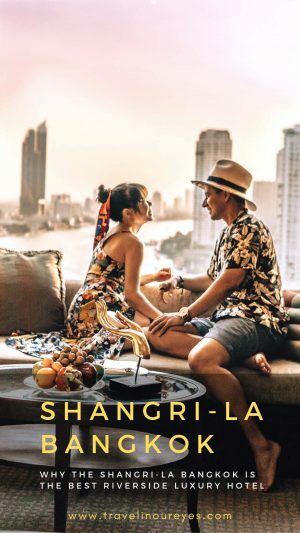 Check the latest prices and book the Shangri-La Bangkok here. 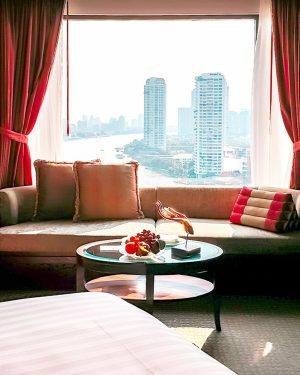 SO/ SOFITEL BANGKOK: A visually stunning luxurious urban hotel designed by Thailand’s top five designers and Christian Lacroix. The hotel is uniquely designed, it’s as if it’s a modern art gallery. Perfect for all art and design enthusiasts who want to explore every part of the city. Check the latest prices and book the SO/ SOFITEL BANGKOK here. VOLVE HOTEL BANGKOK: A warm, chic designer hotel located in the hip district of Thonglor. Perfect for travelers who want to explore a less touristy side of Bangkok. And to food lovers, Thonglor is known to have some of the best restaurants, cafes and bars in Bangkok! Check the latest prices and book the VOLVE HOTEL BANGKOK here. For other places to stay in Bangkok, click here for a list and the latest prices.